You are here: Home » Blog » Opinions » listen » Are you thinking what I’m thinking? I come from a long line of storytellers. My father was a great raconteur, and his father before him, and I suspect many more fathers before him. As a child, Sundays after lunch would be spent listening to my grandfather who, disappearing behind a blue plume of Three Nuns ready rubbed pipe smoke, would start with the same words: “Have I ever told you about the time…” I don’t know why he started like that, because whatever we answered made not a blind bit of difference. He was in the groove. Recently an article in the Harvard Business Review pointed me towards a fascinating piece of research by Uri Hasson of Princeton around storytelling and listening. You can read the original article is here. 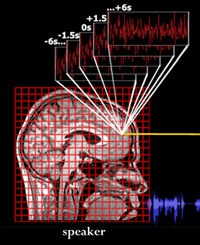 The research involved recording the neural activity of subjects via function MRI scanning whilst one retells a story to others. They mapped the neural activity across the brain and compared the speaker and listener’s patterns. They discovered that usually the listener’s brain activity mirrors the speaker’s with a slight delay. This ‘coupling’ only happens when there is successful communication (if, for example, the listener does not understand the speaker, it does not happen). What is surprising is that in some areas of the brain the listener’s neural activity could anticipate, or precede, the speaker’s. This was particularly the case when there was greater comprehension of the story (as tested after the experiment); the greater the understanding, the greater the anticipation in the coupling. Storytelling and listening is so vital in new product development and marketing that this really caught my attention. We want to hear our customers’ stories very clearly, to empathize with them and to understand them deeply so that we can ensure that our new products meet their needs. And similarly, when we are seeking to inform the market of our product’s benefits, we want to do so in a compelling and engaging way, one that would resonate with our target customers. Neural coupling seems like a good thing to aim for in both cases. The research does not discuss the skill of either the storyteller or the listener. What impact does the skill have upon the level of coupling? I would assume that a more skilful storyteller could improve the level of understanding, and therefore presumably the level of coupling. The same logic would suggest that a better and more attentive listener could comprehend more and achieve a higher level of coupling. There has been a lot written in management texts on the use of narrative in communicating a vision or illuminating emotion. I’ve not seen much about listening. Why is that? Perhaps listening is one of those embarrassingly emotional and personal skills that modern alpha male managers don’t like to talk about. Telling a story might be seen as ok, after all at least you are standing in front of people and telling them something, at least it is directive. But in new product development, skilful listening is vital. Our prospective users and customers may not be skilled storytellers. They may not structure what they tell you, it may have no beginning or end; in their eyes there may be little point to it. It will not be filled with fascinating details, with characters with whom we will naturally empathise, or about thrilling derring-do. There will be no rhythm to the story, no gathering of pace, nor any attention arresting alliterations. We have to hear the story behind that. We have to listen as storytellers, picking out not just the important detail, but the underlying meaning. We have to listen so attentively that we can empathise with the speaker, and ultimately retell their story in an engaging and convincing fashion. It would seem that the ability to achieve neural coupling is yet another vital skill for the Product Manager. This entry was posted in listen and tagged customer, process, product management, users. Bookmark the permalink. One Response to Are you thinking what I’m thinking?